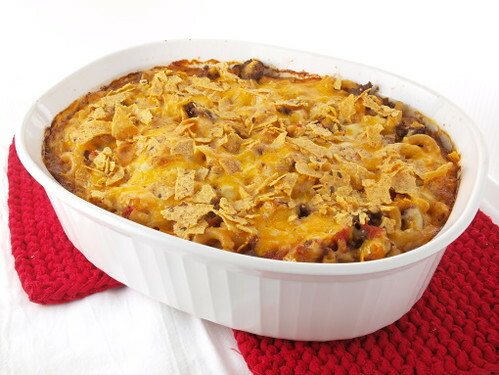 Home » Cooking » Taco Mac and a Rotel Giveaway! **UPDATE** The lucky winner is comment #109! Congratulations to Addie! I hope you enjoy your prize!! I’m doing something very rare … I’m hosting a giveaway! If you have read my blog you know I have an ongoing, and passionate, love affair with Rotel tomatoes. They are a pantry staple in my kitchen and I use them in all sorts of Tex-mex dishes (See my Baked Sopes with Skirt Steak and Black Beans and Beef Empinadas.) I even used them in a new recipe perfect for the cooler weather. 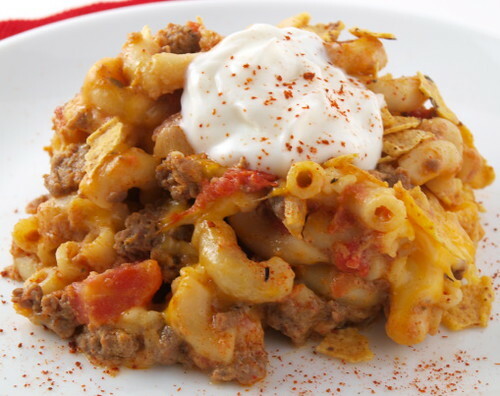 Taco Mac – cheesy pasta spiked with seasoned taco meat and Rotel tomatoes – combines my love of tacos and macaroni and cheese in one comforting dish. That’s three chances to win a prize pack that will come in handy now that football, hockey, and basketball seasons are well underway! This giveaway is sponsored by ConAgra Foods. The giveaway ends November 7, 2010 at 11 pm CST. The winner will be selected at random and notified via email no later than November 8, 2010. So, good luck … and here is some Taco Mac love! 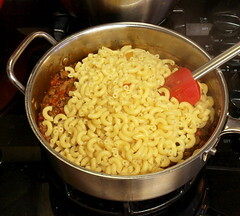 Cook the pasta according to the package directions, but reduce the cooking time by one minute. Drain and set aside. 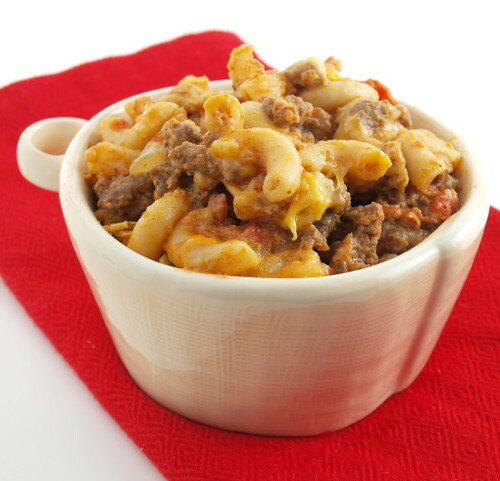 Heat the oven to 350 F and spray a 2-1/2-quart casserole dish with non-stick cooking spray. In a large skillet over medium heat melt the butter until it foams. 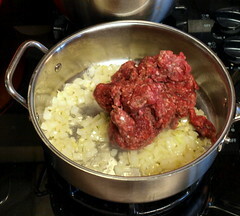 Add the onion and cook until it begins to soften, about three minutes. 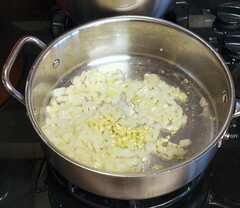 Add the garlic and cook until fragrant, about thirty seconds. 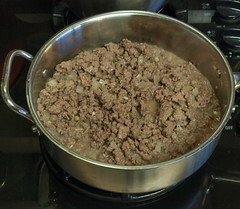 Add the ground beef and cook until thoroughly browned, about ten minutes. Drain away any excess fat. 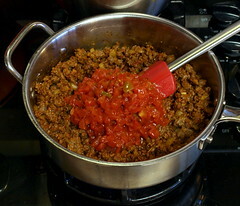 Add the Rotel tomatoes, taco seasoning, and salt and cook until thickened, about five minutes. Turn off the heat and cool slightly. 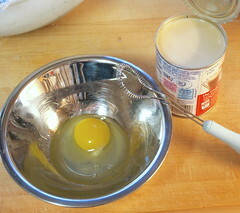 In a medium bowl combine the evaporated milk and egg until well mixed. 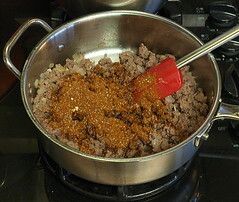 Pour the egg and milk mixture into the beef, stirring constantly. Add the cooked pasta and turn to coat. 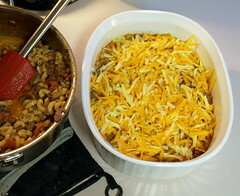 Pour half the meat mixture into the casserole. Add 2 ounces each of the cheddar, colby-jack, and queso quesadilla cheeses. 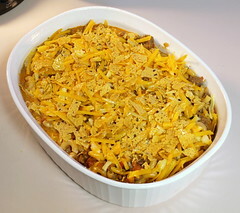 Pour over the remaining meat and top with the rest of the cheese and the crushed tortilla chips. Bake for thirty minutes, or until the casserole is bubbling and the top is melted and browned. Cool for five minutes before serving. Garnish with cold sour cream. Evil Shenanigans Product Review Policy and Disclosure– ConAgra Foods is providing the prize for this contest at no cost to me. My participation in this promotion has entered me into a prize drawing, but I did not accept monetary compensation for reviewing or writing about this contest. Any opinion expressed is my own and is not influenced in any way by the manufacturer/PR firm. I only review products that I have personally tested and endorse.